Back in May of 2011, we received an e-mail from IKEA asking to participate in our $300 House workshop. I was very excited to hear that IKEA wanted to "look into what it takes to develop a flatpack, low cost house for refugee areas (temporary living, not in slum)." Now, it's here! The IKEA Foundation announced its flat-pack houses - refugee shelters which are a significant step up from the tent cities we associate with refugee camps. 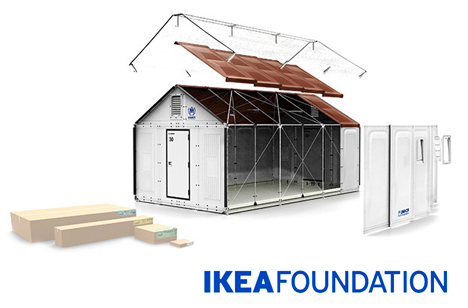 It's part of the IKEA Foundation's commitment to refugee children around the world. According to the folks at IKEA: "Many of the current shelters used in refugee camps have a life span of approximately six months before the impact of sun, rain and wind means it needs to be replaced. Yet long-term refugee situations mean that, on average, refugees stay in camps for 12 years." The UNHCR says it is installing 50 shelter prototypes (weighing 100 kilos each) with flexible solar panels on the roofs for power and specially made walls that can deflect heat during the day and retain it at night.The prototypes, with their semi-hard plastic walls and roofs made from composite material and with room to house five people each, have cost $US8000 apiece, and the UNHCR wants feedback from refugees before approving more wide-scale production. Over time, the UN agency expects the price for the new shelters to come down to about $US1000, which is still double the $US500 it pays for each of its refugee tents. The prototype shelters were all made by hand in Sweden, although not in IKEA factories. More than 15 million people were living as refugees around the world last year. Almost 29 million were displaced within their own country - the highest combined number in two decades, as per UNHCR. Kudos to IKEA and the UNHCR. Now how about trying something like this? This page contains a single entry by Christian published on July 5, 2013 2:43 AM. $300 House: an update from Harvey Lacey was the previous entry in this blog. Solving the Roofing Problem for Rural India? is the next entry in this blog.